Today's flooring trends lean towards hard surface flooring like tile, resilient floors and hardwood. Hard surface floors are durable and easy to maintain. And thanks to modern manufacturing techniques, hard surface flooring is also beautiful. Porcelain tile in particular can bring a wide range of designs to your home all with the practical benefits of tile flooring. Let's review a few flooring trends and learn how porcelain fits for each of them. Hardwood flooring has long been a popular flooring choice but it doesn't work in all rooms of the house. In those situations homeowners often turn to tile or other hard flooring varieties. Today you can turn to tile and still have the look of wood that you want. Porcelain tile can be installed in planks for a very realistic wood-look. Porcelain tile can also be a more cost-effective way to take advantage of certain wood looks like distressed wood, painted wood or cross grain cuts. Brick tile installations have been fairly popular on walls in recent years but we are seeing this trend make a move to floors. As you can imagine, laying actual bricks for a floor can be expensive and impractical. However, porcelain tile can be made to the same size and look as brick and come in a variety of colors for a very modern look or even aged, rustic colors for a more distressed, reclaimed look. Marble floors give an instant impression of cool luxury. That look, however, comes at a fairly steep price. Porcelain tile can be made to look exactly like marble giving you the look you want at a fraction of the cost. These are just three examples of how porcelain tile can bring high design into your home. Porcelain tile is one of the most versatile floors on the market. 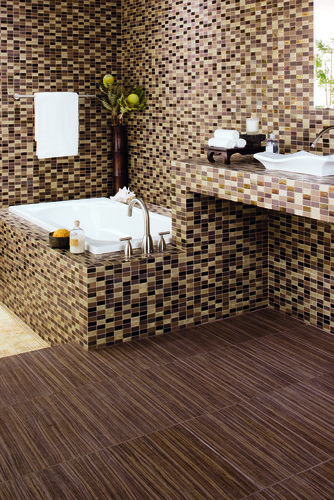 Stop by our Indianapolis tile floor and learn more about practical, beautiful porcelain tile.